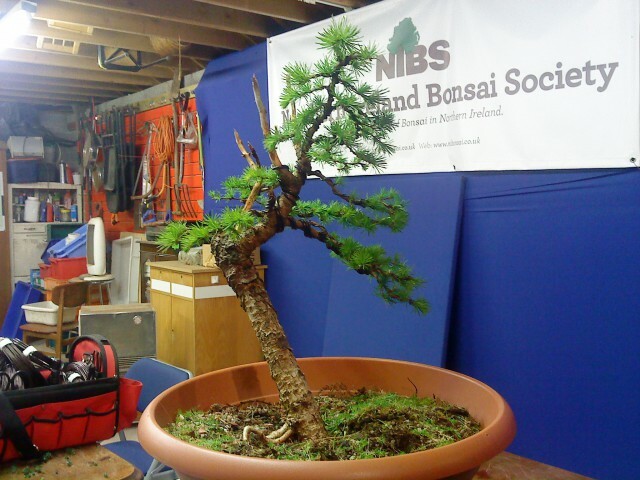 This larch was last rootpruned two years ago. 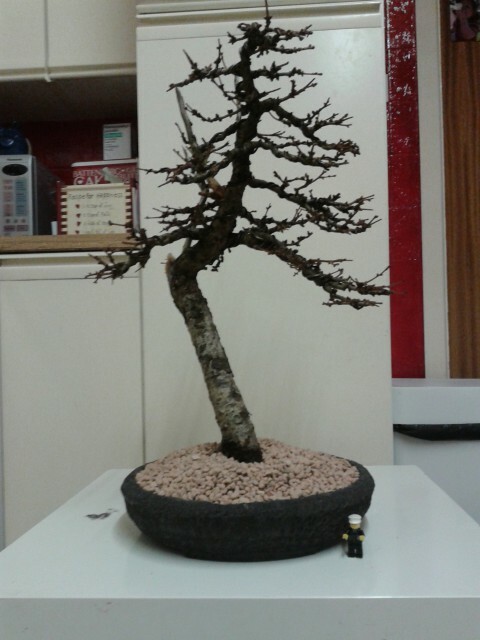 Since then it has risen slightly out of the pot and the chopped nebari isn’t very attractive. 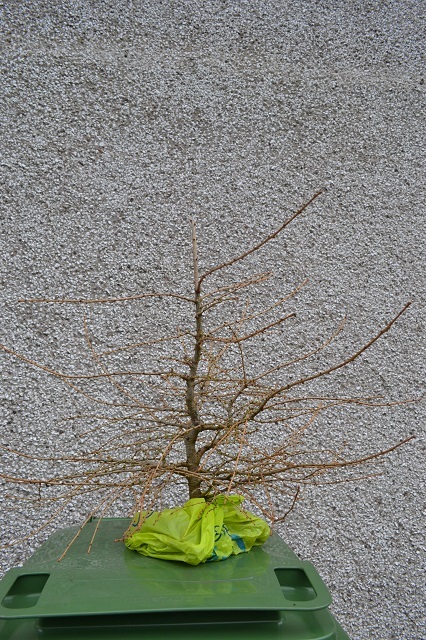 To remedy this I tilted the tree forward slightly and removed more from underneath the front of the rootball. I also cut back the long back roots, not by much as it’s the type of work that is best done slowly over time. 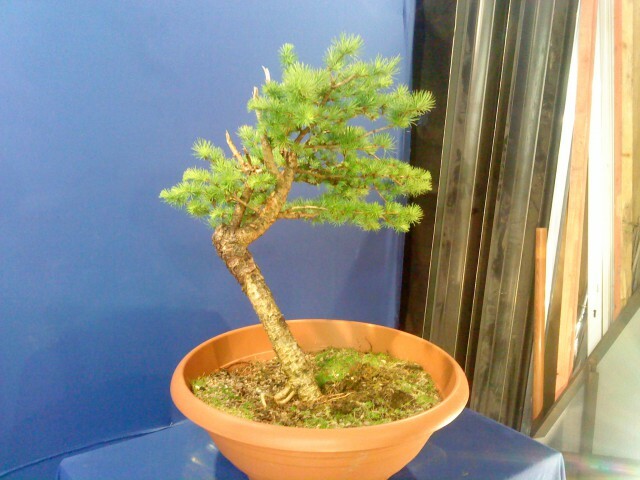 One other change I made was to rotate the front of the pot. I read somewhere that ideally a pot should be displayed with the most stable looking front. 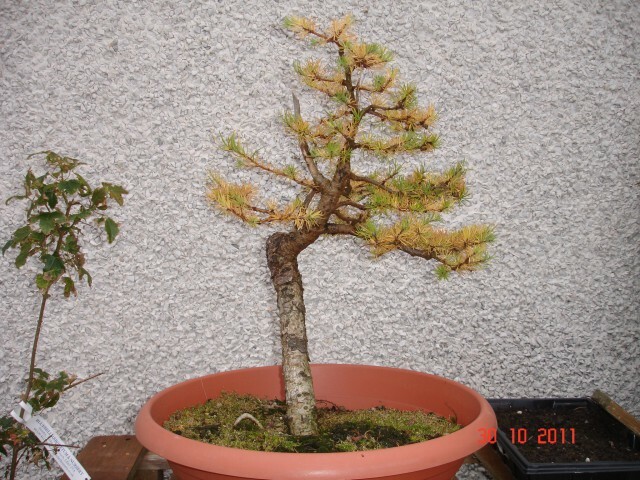 For this pot, it means showing the two pot feet either side of the tree, as opposed to just one foot showing in the first photo above. 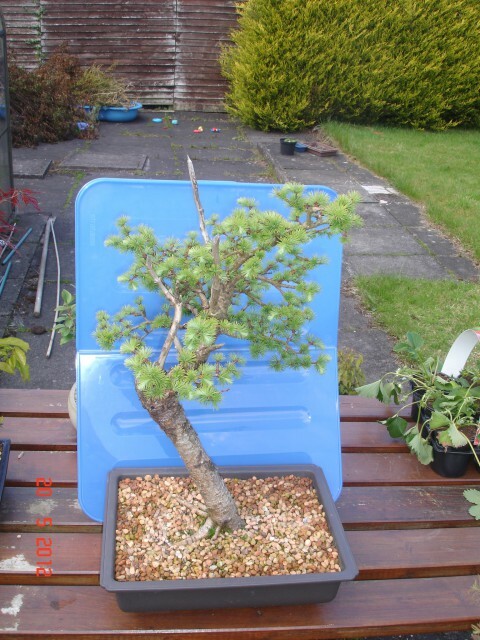 A Larch lifted…and then returned. 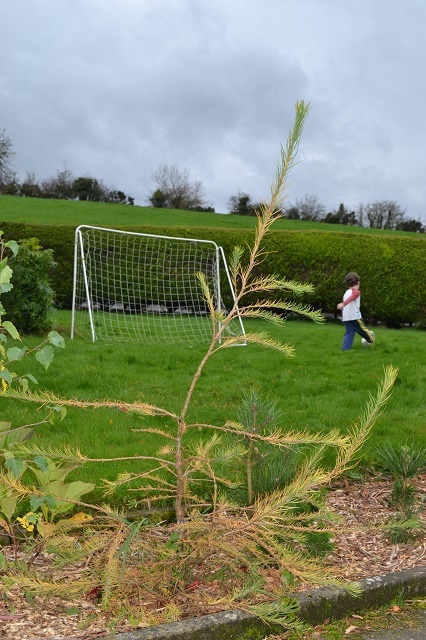 I bought this Japanese Larch as a seedling four years ago and when moving here I planted it in a flower bed and planned to leave it to bulk up. It’s grown pretty well and reached 5ft last year before I chopped the trunk down to about 2-3 ft in the autumn. 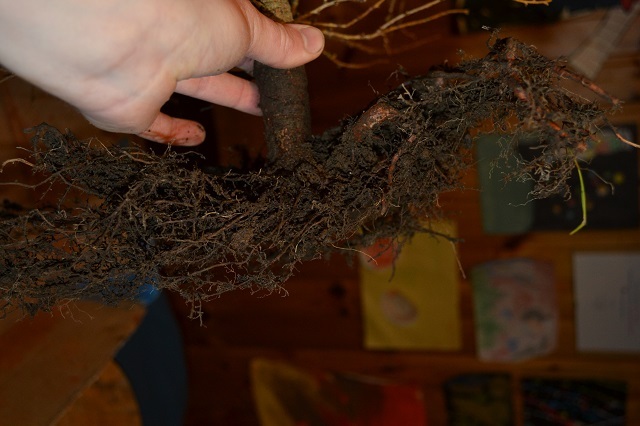 I decided to lift it and look at the roots. It had been planted on a tile so the rootball was pretty flat. Unfortunately the nebari is not great and consists of two thick roots which I hadn’t anticipated. In hindsight, I should have inspect the roots before now. I decided, rather than settling for this, to try and develop a new set of roots using a tourniquet of wire. I placed it just below the lowest branch at an angle. 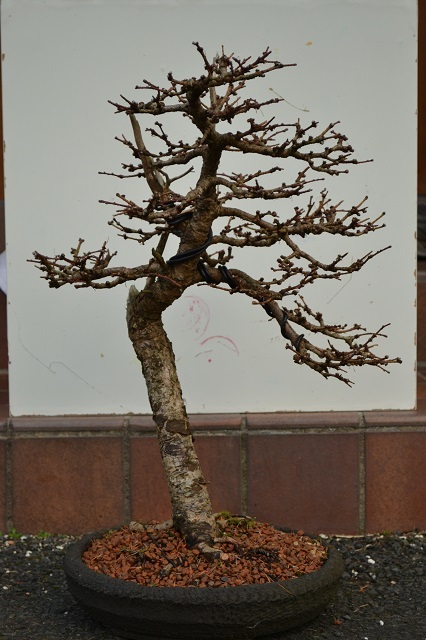 After some significant pruning, A twin trunk image is starting to form. 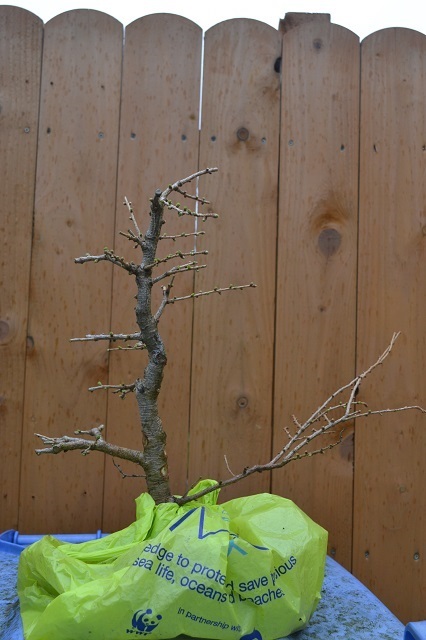 I’ll let the thin trunk grow unhindered while developing the ramification of branches on the main trunk. It might be cut down further in future, I’ll wait and see what happens with the roots. 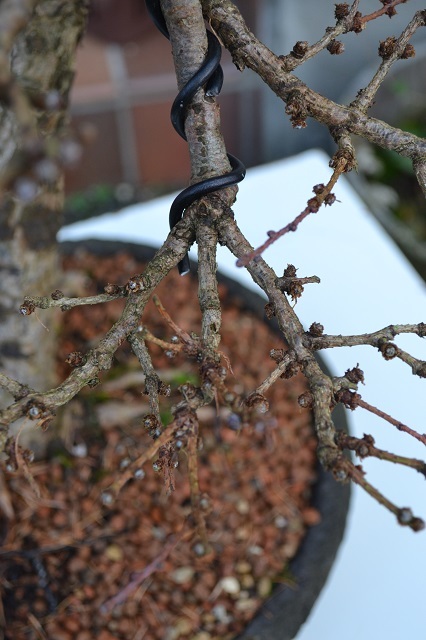 The lowest branch is very thick so I’ll keep it tightly pinched. 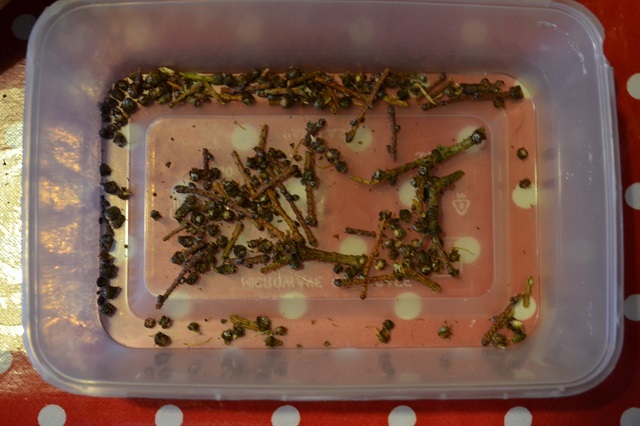 Anybody had any luck with developing new roots on a larch before? 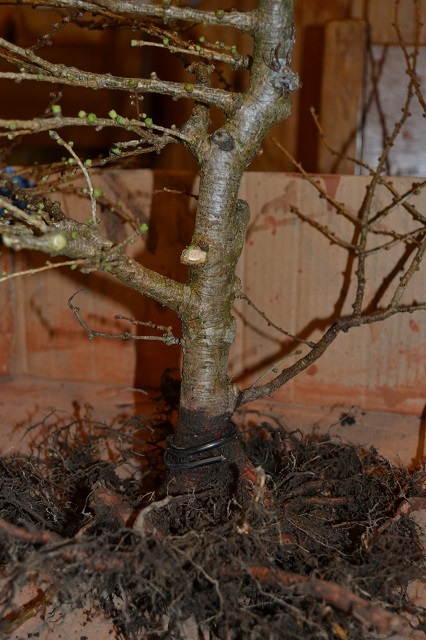 Just before putting it back in the ground I used wire to bring the minor trunk up so that it competes with the major trunk for light. Hopefully it should increase in girth considerably this season. 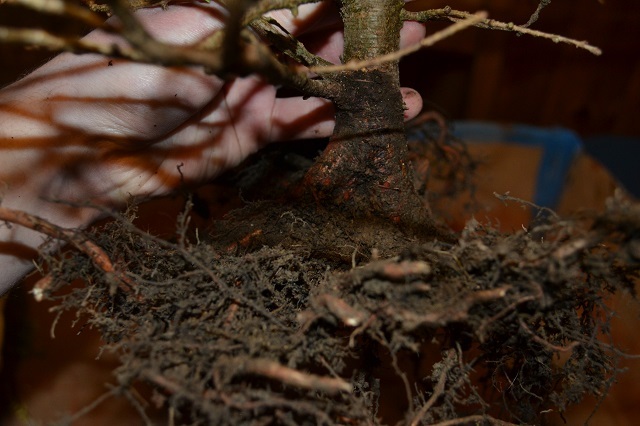 I didn’t do much work on the roots – they will only be cut off if the tourniquet produces a new set in the ground. We’ll wait and see! 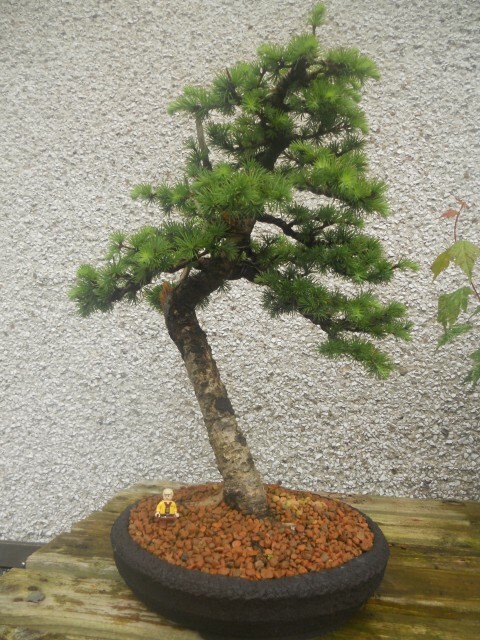 I recently had a look at my chuhin Japanese Larch now that all the needles have dropped. 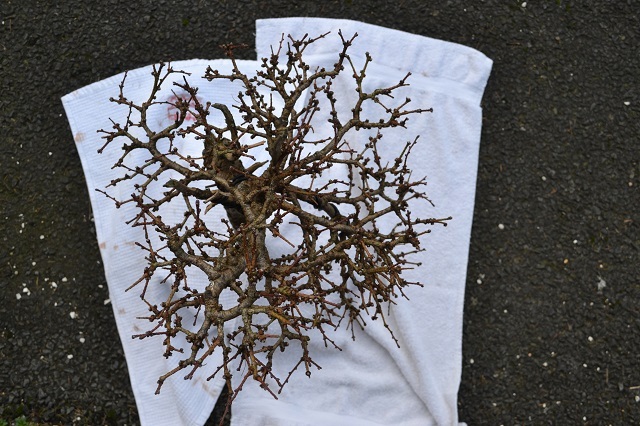 Any remaining ones on the tree were cleared and I then carried out some very light pruning of this year’s extension growth to maintain the outline of the tree and also to avoid any long straight branches. 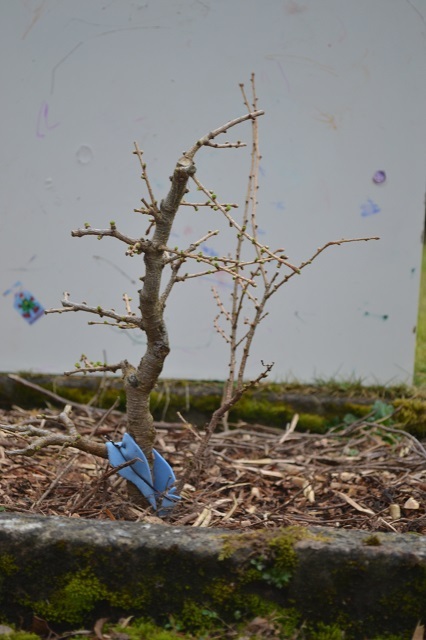 While I was at it I then removed surplus buds growing in undesirable places. 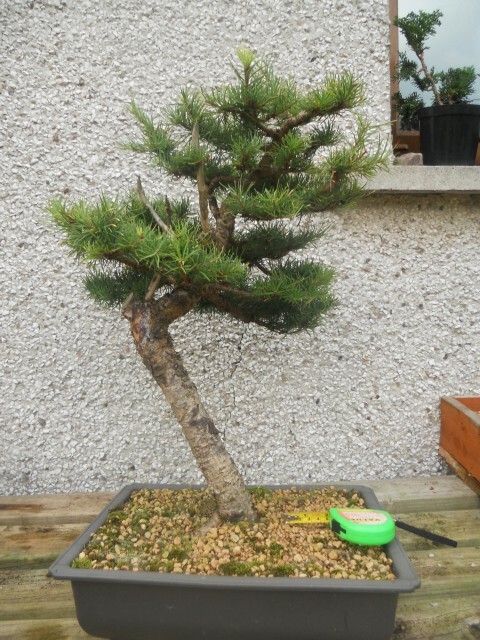 The tree had a slow year due to the repot in March but should come back strong next year I hope. It’s staying in the open greenhouse. 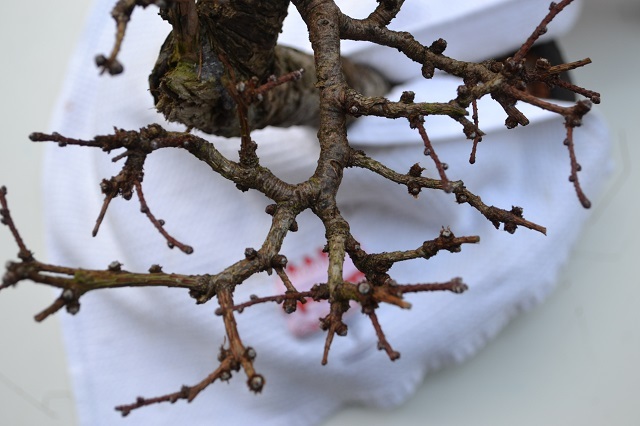 Next year I plan to work on the deadwood, increase foliage density in some areas and also improve branch structure by pruning undesirable secondary branches. 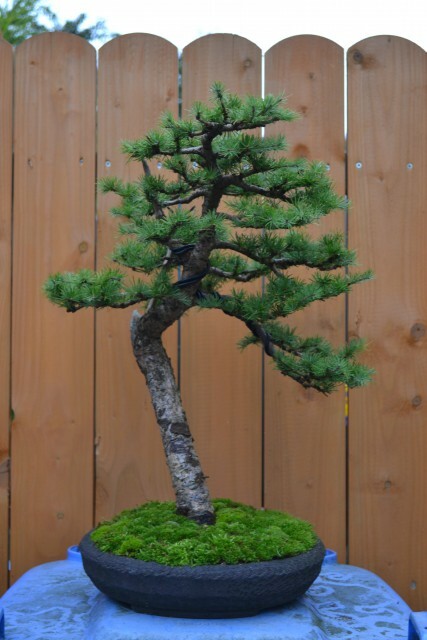 Foliage to be increased on the left and apex. 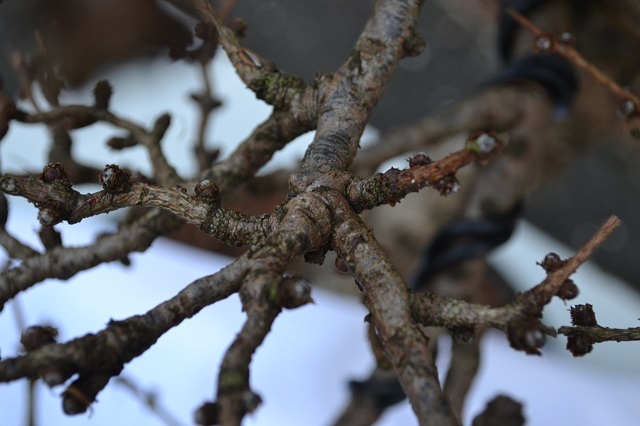 Three branches at one junction. One shall go next year.